I love the scents of autumn-whether it’s putting on a simmering pot or the smell of fresh apple bread baking-it’s an easy way to lift my mood. 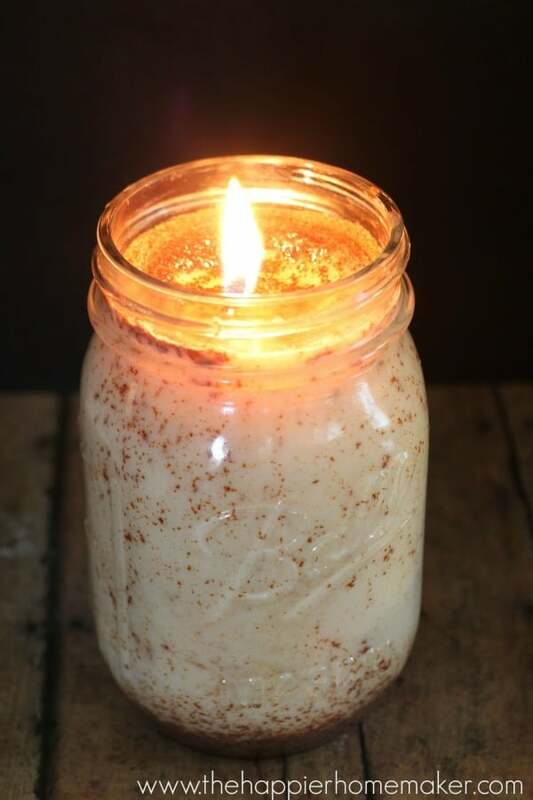 This week on a particularly dreary rainy day I decided to make a scrum-delicious smelling DIY cinnamon candle and it was so easy I thought you all would enjoy trying one for yourself! 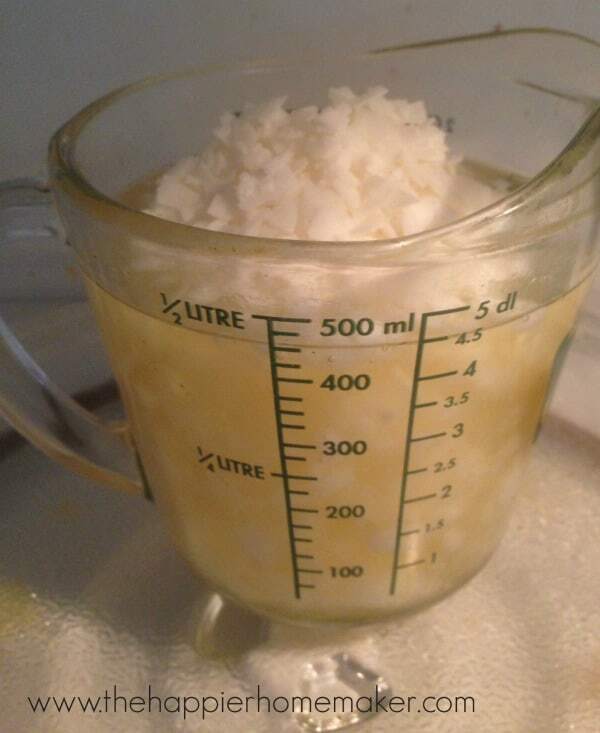 While you wax is melting, prepare your candle wick. Wrap the end of the wick around a wood skewer or pencil and balance the skewer on the top of the jar-this holds the wick in place while your candle sets. Make sure the metal end of the wick rests all the way at the bottom of the jar. 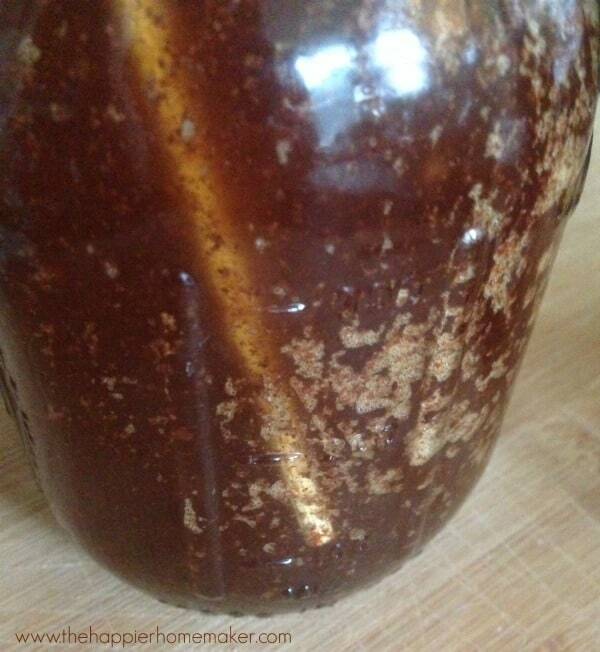 Slowly pour the wax mixture into the jar, adjusting your wick if it moves during the pouring. 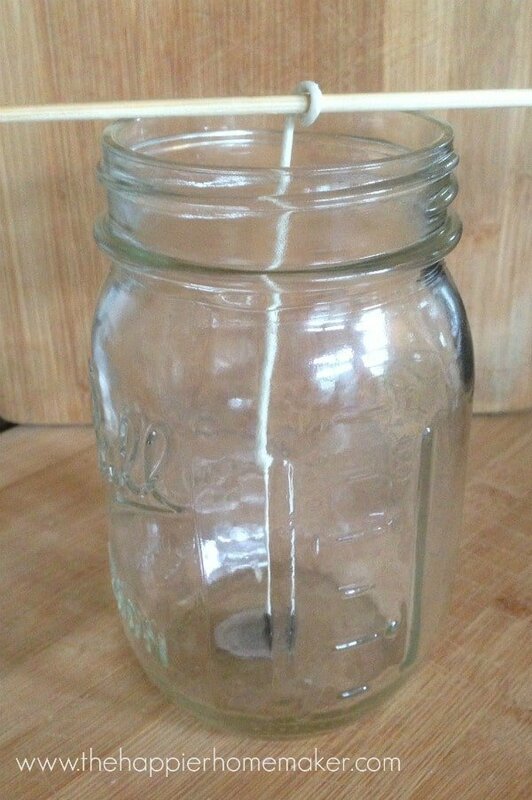 If there are any air bubbles on the sides of the jar use your wood skewer to rub the inside of the jar to release them to the top. This is aesthetic-if you’re using an opaque container this isn’t an issue. 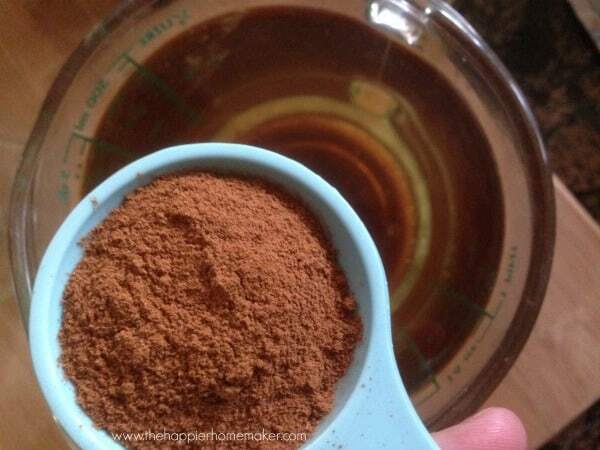 Allow the cinnamon candle to set for 4-5 hours until firm. Light it up and enjoy! I love seeing the specks of spice in the wax and how it settles in different ways through the wax as it dries! 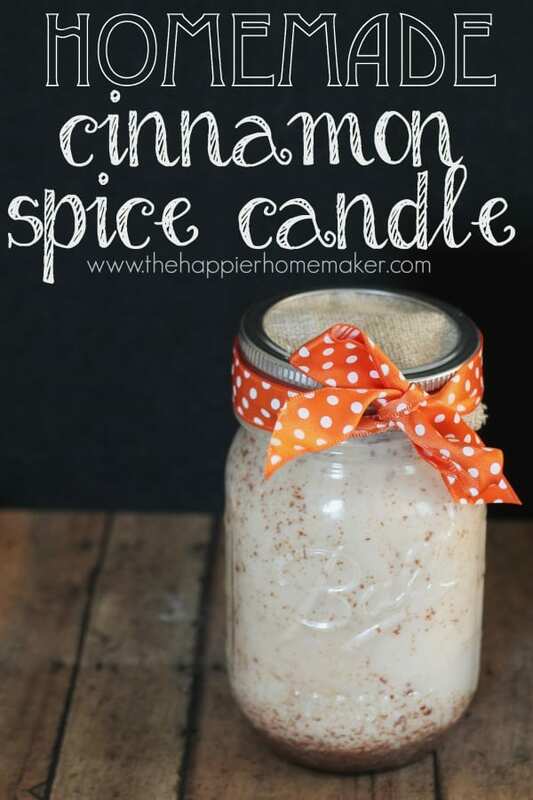 These cinnamon candle make great DIY gifts as well…if you’re going to make quite a few I recommend buying the bulk-sized packages of the wax-you’ll save a lot of money! What are your favorite autumn scents? 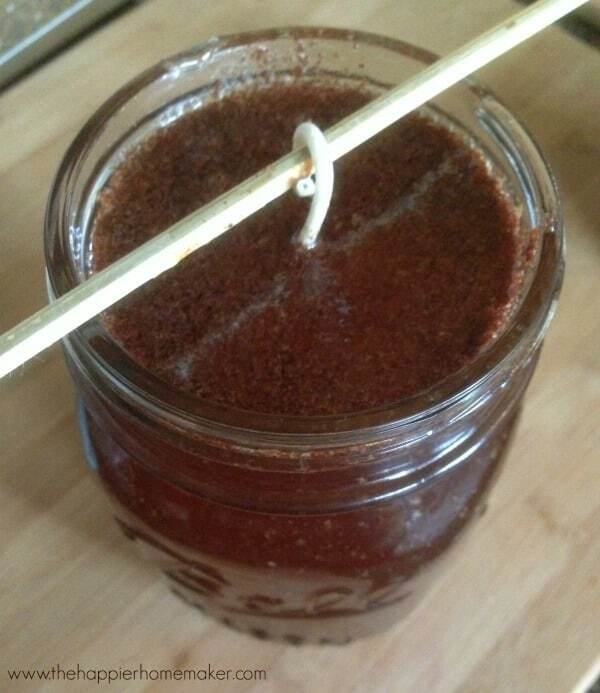 Have you tried making your own cinnamon candle before? What kind of wick did you use? I am also curious what kind of wick you used. Your reference back to Amazon for the wick just goes to the wax that you used, not the wick size. Thanks! This post was 3 years old but I managed to find the wicks in my disaster of a craft room and they are these: http://amzn.to/2iRo8F1 I will update the link above, sorry about that. I’m so making these. Ordering WAX ASAP!! So after putting in the cinnamon, the candle still settles as a white color like yours? It doesn’t turn brown? Can’t wait to make them. Thanks for your response! I do not have Vanilla Essence, so will the candle be any different without it? So I tried making some of these candles, I’m not getting much of a scent, however I’ve been buying different essential oils that’s helping. I’m having a hard time with the wicks I believe it is. When I light them, the flame is so low, it ends up going out. I bought prewaxed wicks. Is there something I’m doing wrong?